When motor vehicle drivers ignore the pedestrian’s right-of-way on a crosswalk, people get killed. The National Highway Traffic Safety Administration reported that approximately 500 pedestrians were killed while walking in a crosswalk. It is a stunning number given that the crosswalk is where we push pedestrians to be. 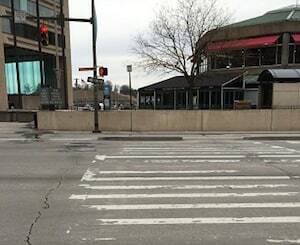 Ostensibly a safe haven for pedestrians, the crosswalk is often anything but safe. Most of these pedestrian crosswalk serious injury and death cases are in urban areas like Baltimore City. But we see crosswalk accident cases every year in rural areas often because many drivers in those areas just do not have their minds trained to think of pedestrians and they have a “I’m in a car therefore the road must be mine” way of thinking. This way of thinking – in the city or in the suburbs – brings too many tragedies to our law office. To put this in context, these 500 pedestrian deaths a year make up only about 10% of pedestrian deaths. But crosswalk injuries and deaths make up a disproportionate number of pedestrian accident lawsuits in Maryland because victims in the crosswalk are generally going to be successful in bringing their claims. Why? The crosswalk is supposed to be a safe haven for those on foot. Crosswalk accidents are caused by a number of things. Distracted drivers, drunk drivers, or plain bad drivers cause these injuries. Any city dweller knows that a particularly dangerous situation occurs when you have the “walk” sign and the cars traveling in the same direction have a green light. Even though the car has a green light, it is up to the driver to make sure they do not hit you if they are making a right turn. Maryland law specifically requires that drivers yield to pedestrians at crosswalks when they are on the half of the roadway in which the driver is traveling or approaching from the other lane. Also, when a car stops to allow a pedestrian to cross, the law forbids another car from overtaking the stopped car. Of course, how many drivers are even aware of these laws? But common sense and Maryland law under § 21-502 of our Transportation Code says that when a pedestrian has the right-of-way at an intersection, that pedestrian has the right to assume that the driver of a motor vehicle will obey our law and yield the right-of-way to those of us on foot who are making a crossing. But Maryland’s high court has also made clear that this is not to say that a pedestrian may blindly step into the path of an oncoming automobile simply because he is in a crosswalk (the court also importantly says that it also does not mean that it is negligent per se if she crosses in the middle of a street, either.) Yes, the pedestrian may rely on a motorist respecting that right unless it is or becomes apparent that the motorist will not. What this means is the legal preference the pedestrian enjoys at a crosswalk is Maryland is not boundless under § 21-502. Pedestrians must still exercise due care and remain vigilant to avoid a collision. We cannot cross the road blindly without looking for approaching traffic. Under Maryland, contributory negligence law, you may not recover for damages in a pedestrian accident if you are also yourself responsible for the accident. There is a Maryland law on crosswalks – Maryland Transportation Code Ann. § 21-503 – that makes clear that you do not need to have crosswalk markings to have a crosswalk. 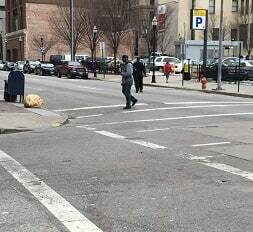 There are unmarked crosswalks at most intersections with connecting sidewalks. It is amazing how many police officers and even lawyers and judges who are not aware of this Maryland rule regarding unmarked crosswalks. Our law firm has looked at so many police reports where the police describe the accident perfectly but get who is at-fault completely backwards. This is unfortunate because while police reports are not even admissible at trial, many victims assume the officer’s report is correct and do not bring their very viable claims. Just as in any pedestrian accident, a crosswalk accident victim’s injuries are likely to be substantial. Common injuries include broken bones, head trauma, spinal trauma, and death. These injuries all have one thing in common: they are severe. Unfortunately, that is the reality of pedestrian accidents. Provided that they were crossing properly, those involved in crosswalk accidents likely have the law on their side. The proper course of action in those scenarios is to contact an attorney to ensure compensation for injuries, pain, suffering and mental anguish. The following verdicts should give you an idea of the approximate value of a crosswalk accident case. Remember, though, juries are unpredictable and awards can be all over the place based upon the composition of the jury itself. 2015, Maryland: $424,811 Verdict: A woman and her child were crossing a five lane road. They successfully made it across the first three lanes when a driver stopped to allow them to cross the fourth lane. However, another driver overtakes the stopping car and strikes the pedestrians. The pedestrians sue after the woman suffers serious leg fractures. The defense argued that they pedestrians did not cross at a crosswalk, however the jury disagreed and awarded a $424,811 verdict. 2012, Maryland: $27,500 Verdict: A man is crossing a four lane road when a car strikes him as he traversed the fourth lane. He sustains scarring and a leg fracture as a result of the injury. He sues the driver, who contends that the plaintiff should not have run out into traffic. The jury awards $27,500 to the pedestrian. 2011, Maryland: $260,665 Verdict: A pregnant woman is crossing in a crosswalk near her home when a taxi driver runs into her. He continues to drive for a few feet with her on the hood and finally stops. He berates her as they stop. She sues the taxi driver, and a Montgomery County jury ultimately awards her $260,665. 2011, Maryland: $7,934 Verdict: A woman is walking in a crosswalk when a driver making a right turn strikes her. They end up being uninsured, so she seeks recovery from her uninsured motorist carrier. She complains of only soft-tissue injuries and seeks pain and suffering of upwards of $12,000. The jury awards $7,934. If you or a family member have been injured , you have the right to be compensated for your injury or loss. The attorneys at Miller & Zois handle serious auto related cases on a daily basis and are equipped with the skill, knowledge, and understanding to guide you through this difficult process. Call us at 800-553-8082 or get a free consultation online.